Industrial production data for December 2018, released earlier today by Istat, came in well below consensus, confirming that the soft patch of Italian manufacturing activity continued without any relief until the end of 2018. The seasonally adjusted measure was down 0.8% month on month (from -1.7% MoM revised in November), posting the fourth consecutive monthly contraction. The working day adjusted measure, better suited to follow the trend, turned out a disappointingly weak -5.5% year on year (from -2.6% YoY in November), the steepest yearly fall since March 2013. A quick look at big aggregates shows that the monthly contraction was marked in consumer goods (-2.9% MoM) and in energy (-1.5% MoM); production was flat on the month for investment goods and marginally positive (+0.1% MoM) in intermediate goods. Looking at the whole of 2018, average industrial production was up 0.8% on the year, with the manufacturing component up 0.9%. This comes as little consolation as it builds mostly on the positive statistical carryover of 2017. 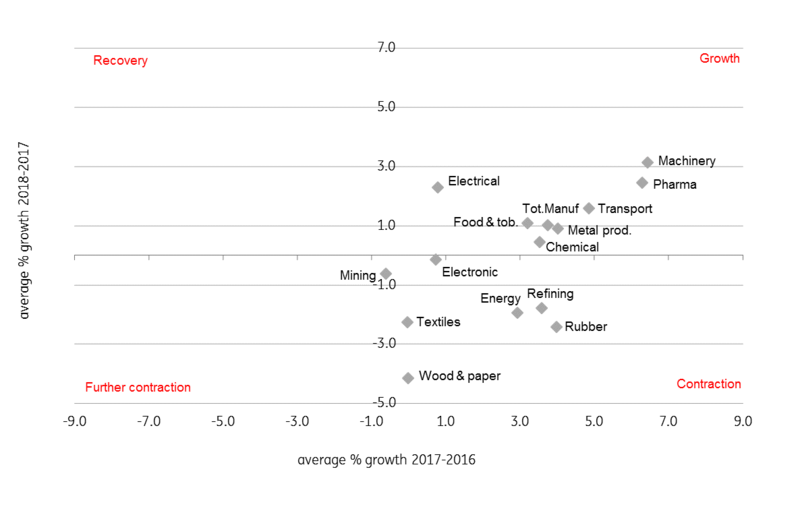 The sector breakdown shows that machinery and plants (+3.1% YoY) and other manufacturing, installation and repair (+2.8% YoY), more linked to the business investment cycle, were the fastest growing sectors, followed by pharmaceuticals (+2.4% YoY), while sectors more linked to the construction chain such as wood (-4.1% YoY) and plastics and non-metal minerals (-2.4% YoY) confirmed the laggards. The poor December production release brings the 4Q18 performance down to a disappointing 1.1% QoQ contraction, which leaves a negative statistical carryover to 2019. Based on soft indicator evidence for January, chances of an exit from recession already in 1Q19 look slim. Manufacturing business confidence fell again in January and both the order book and the expected production components were anticipating further declines. This was consistent with the relevant PMI reading, down to 47.8, the lowest reading since May 2013. Confidence was down also among service sector businesses, leaving the onus of growth on households. With both supply and demand indicators anticipating more weakness, and with resuming tensions in BTP-Bund spreads, we expect the first quarter to confirm Italy in recession. Rising political uncertainty is not helping either: with both leaders of the coalition parties in campaign mode for both a round of local regional elections and for the European Parliament ones, re-creating an investment-friendly environment will not be easy in the short run. Our new base case profile pencils in another GDP contraction for 1Q19 and foresees a very gradual recovery thereafter; this would translate into a miserable average growth rate of 0.1% in 2019, with downside risks. In case you missed it: Trade truce falling apart?